Mercury is tidally locked with the Sun in a 3:2 spin-orbit resonance, and rotates in a way that is unique in the Solar System. As seen relative to the fixed stars, it rotates on its axis exactly three times for every two revolutions it makes around the Sun. [a] As seen from the Sun, in a frame of reference that rotates with the orbital motion, it appears to rotate only once every two Mercurian years. An observer on Mercury would therefore see only one day every two Mercurian years. Mercury's axis has the smallest tilt of any of the Solar System's planets (about ​1⁄30 degree). Its orbital eccentricity is the largest of all known planets in the Solar System;[b] at perihelion, Mercury's distance from the Sun is only about two-thirds (or 66%) of its distance at aphelion. Mercury's surface appears heavily cratered and is similar in appearance to the Moon's, indicating that it has been geologically inactive for billions of years. Having almost no atmosphere to retain heat, it has surface temperatures that vary diurnally more than on any other planet in the Solar System, ranging from 100 K (−173 °C; −280 °F) at night to 700 K (427 °C; 800 °F) during the day across the equatorial regions. The polar regions are constantly below 180 K (−93 °C; −136 °F). The planet has no known natural satellites. Mercury appears to have a solid silicate crust and mantle overlying a solid, iron sulfide outer core layer, a deeper liquid core layer, and a solid inner core. Mercury is one of four terrestrial planets in the Solar System, and is a rocky body like Earth. It is the smallest planet in the Solar System, with an equatorial radius of 2,439.7 kilometres (1,516.0 mi). Mercury is also smaller—albeit more massive—than the largest natural satellites in the Solar System, Ganymede and Titan. Mercury consists of approximately 70% metallic and 30% silicate material. Mercury's density is the second highest in the Solar System at 5.427 g/cm3, only slightly less than Earth's density of 5.515 g/cm3. If the effect of gravitational compression were to be factored out from both planets, the materials of which Mercury is made would be denser than those of Earth, with an uncompressed density of 5.3 g/cm3 versus Earth's 4.4 g/cm3. Mercury's density can be used to infer details of its inner structure. Although Earth's high density results appreciably from gravitational compression, particularly at the core, Mercury is much smaller and its inner regions are not as compressed. Therefore, for it to have such a high density, its core must be large and rich in iron. Geologists estimate that Mercury's core occupies about 55% of its volume; for Earth this proportion is 17%. Research published in 2007 suggests that Mercury has a molten core. Surrounding the core is a 500–700 km (310–430 mi) mantle consisting of silicates. Based on data from the Mariner 10 mission and Earth-based observation, Mercury's crust is estimated to be 35 km (22 mi) thick.. One distinctive feature of Mercury's surface is the presence of numerous narrow ridges, extending up to several hundred kilometers in length. It is thought that these were formed as Mercury's core and mantle cooled and contracted at a time when the crust had already solidified. Mercury's core has a higher iron content than that of any other major planet in the Solar System, and several theories have been proposed to explain this. The most widely accepted theory is that Mercury originally had a metal–silicate ratio similar to common chondrite meteorites, thought to be typical of the Solar System's rocky matter, and a mass approximately 2.25 times its current mass. Early in the Solar System's history, Mercury may have been struck by a planetesimal of approximately 1/6 that mass and several thousand kilometers across. The impact would have stripped away much of the original crust and mantle, leaving the core behind as a relatively major component. A similar process, known as the giant impact hypothesis, has been proposed to explain the formation of the Moon. Alternatively, Mercury may have formed from the solar nebula before the Sun's energy output had stabilized. It would initially have had twice its present mass, but as the protosun contracted, temperatures near Mercury could have been between 2,500 and 3,500 K and possibly even as high as 10,000 K. Much of Mercury's surface rock could have been vaporized at such temperatures, forming an atmosphere of "rock vapor" that could have been carried away by the solar wind. A third hypothesis proposes that the solar nebula caused drag on the particles from which Mercury was accreting, which meant that lighter particles were lost from the accreting material and not gathered by Mercury. Each hypothesis predicts a different surface composition, and there are two space missions set to make observations. MESSENGER, which ended in 2015, found higher-than-expected potassium and sulfur levels on the surface, suggesting that the giant impact hypothesis and vaporization of the crust and mantle did not occur because potassium and sulfur would have been driven off by the extreme heat of these events. BepiColombo, which will arrive at Mercury in 2025, will make observations to test these hypotheses. The findings so far would seem to favor the third hypothesis; however, further analysis of the data is needed. lowest (purple) to highest (red, 10 km (6.2 mi)). Mercury's surface is similar in appearance to that of the Moon, showing extensive mare-like plains and heavy cratering, indicating that it has been geologically inactive for billions of years. Because knowledge of Mercury's geology had been based only on the 1975 Mariner 10 flyby and terrestrial observations, it is the least understood of the terrestrial planets. As data from MESSENGER orbiter are processed, this knowledge will increase. For example, an unusual crater with radiating troughs has been discovered that scientists called "the spider". It was later named Apollodorus. Albedo features are areas of markedly different reflectivity, as seen by telescopic observation. Mercury has dorsa (also called "wrinkle-ridges"), Moon-like highlands, montes (mountains), planitiae (plains), rupes (escarpments), and valles (valleys). Names for features on Mercury come from a variety of sources. Names coming from people are limited to the deceased. Craters are named for artists, musicians, painters, and authors who have made outstanding or fundamental contributions to their field. Ridges, or dorsa, are named for scientists who have contributed to the study of Mercury. Depressions or fossae are named for works of architecture. Montes are named for the word "hot" in a variety of languages. Plains or planitiae are named for Mercury in various languages. Escarpments or rupēs are named for ships of scientific expeditions. Valleys or valles are named for radio telescope facilities. Mercury was heavily bombarded by comets and asteroids during and shortly following its formation 4.6 billion years ago, as well as during a possibly separate subsequent episode called the Late Heavy Bombardment that ended 3.8 billion years ago. During this period of intense crater formation, Mercury received impacts over its entire surface, facilitated by the lack of any atmosphere to slow impactors down. 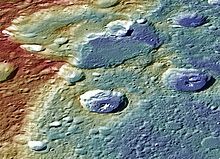 During this time Mercury was volcanically active; basins such as the Caloris Basin were filled by magma, producing smooth plains similar to the maria found on the Moon. Data from the October 2008 flyby of MESSENGER gave researchers a greater appreciation for the jumbled nature of Mercury's surface. Mercury's surface is more heterogeneous than either Mars's or the Moon's, both of which contain significant stretches of similar geology, such as maria and plateaus. Craters on Mercury range in diameter from small bowl-shaped cavities to multi-ringed impact basins hundreds of kilometers across. They appear in all states of degradation, from relatively fresh rayed craters to highly degraded crater remnants. Mercurian craters differ subtly from lunar craters in that the area blanketed by their ejecta is much smaller, a consequence of Mercury's stronger surface gravity. According to IAU rules, each new crater must be named after an artist that was famous for more than fifty years, and dead for more than three years, before the date the crater is named. The largest known crater is Caloris Basin, with a diameter of 1,550 km. The impact that created the Caloris Basin was so powerful that it caused lava eruptions and left a concentric ring over 2 km tall surrounding the impact crater. At the antipode of the Caloris Basin is a large region of unusual, hilly terrain known as the "Weird Terrain". One hypothesis for its origin is that shock waves generated during the Caloris impact traveled around Mercury, converging at the basin's antipode (180 degrees away). The resulting high stresses fractured the surface. Alternatively, it has been suggested that this terrain formed as a result of the convergence of ejecta at this basin's antipode. Overall, about 15 impact basins have been identified on the imaged part of Mercury. A notable basin is the 400 km wide, multi-ring Tolstoj Basin that has an ejecta blanket extending up to 500 km from its rim and a floor that has been filled by smooth plains materials. Beethoven Basin has a similar-sized ejecta blanket and a 625 km diameter rim. Like the Moon, the surface of Mercury has likely incurred the effects of space weathering processes, including Solar wind and micrometeorite impacts. The so-called "Weird Terrain" formed at the point antipodal to the Caloris Basin impact. There are two geologically distinct plains regions on Mercury. Gently rolling, hilly plains in the regions between craters are Mercury's oldest visible surfaces, predating the heavily cratered terrain. These inter-crater plains appear to have obliterated many earlier craters, and show a general paucity of smaller craters below about 30 km in diameter. Smooth plains are widespread flat areas that fill depressions of various sizes and bear a strong resemblance to the lunar maria. Notably, they fill a wide ring surrounding the Caloris Basin. Unlike lunar maria, the smooth plains of Mercury have the same albedo as the older inter-crater plains. Despite a lack of unequivocally volcanic characteristics, the localisation and rounded, lobate shape of these plains strongly support volcanic origins. All the smooth plains of Mercury formed significantly later than the Caloris basin, as evidenced by appreciably smaller crater densities than on the Caloris ejecta blanket. The floor of the Caloris Basin is filled by a geologically distinct flat plain, broken up by ridges and fractures in a roughly polygonal pattern. It is not clear whether they are volcanic lavas induced by the impact, or a large sheet of impact melt. One unusual feature of Mercury's surface is the numerous compression folds, or rupes, that crisscross the plains. As Mercury's interior cooled, it contracted and its surface began to deform, creating wrinkle ridges and lobate scarps associated with thrust faults. The scarps can reach lengths of 1000 km and heights of 3 km. These compressional features can be seen on top of other features, such as craters and smooth plains, indicating they are more recent. Mapping of the features has suggested a total shrinkage of Mercury's radius in the range of ~1 to 7 km. Small-scale thrust fault scarps have been found, tens of meters in height and with lengths in the range of a few km, that appear to be less than 50 million years old, indicating that compression of the interior and consequent surface geological activity continue to the present. The Lunar Reconnaissance Orbiter discovered that similar small thrust faults exist on the Moon. Picasso crater — the large arc-shaped pit located on the eastern side of its floor are postulated to have formed when subsurface magma subsided or drained, causing the surface to collapse into the resulting void. Images obtained by MESSENGER have revealed evidence for pyroclastic flows on Mercury from low-profile shield volcanoes. MESSENGER data has helped identify 51 pyroclastic deposits on the surface, where 90% of them are found within impact craters. A study of the degradation state of the impact craters that host pyroclastic deposits suggests that pyroclastic activity occurred on Mercury over a prolonged interval. A "rimless depression" inside the southwest rim of the Caloris Basin consists of at least nine overlapping volcanic vents, each individually up to 8 km in diameter. It is thus a "compound volcano". The vent floors are at a least 1 km below their brinks and they bear a closer resemblance to volcanic craters sculpted by explosive eruptions or modified by collapse into void spaces created by magma withdrawal back down into a conduit. Scientists could not quantify the age of the volcanic complex system, but reported that it could be of the order of a billion years. Composite of the north pole of Mercury, where NASA confirmed the discovery of a large volume of water ice, in permanently dark craters that exist there. The surface temperature of Mercury ranges from 100 to 700 K (−173 to 427 °C; −280 to 800 °F) at the most extreme places: 0°N, 0°W, or 180°W. It never rises above 180 K at the poles, due to the absence of an atmosphere and a steep temperature gradient between the equator and the poles. The subsolar point reaches about 700 K during perihelion (0°W or 180°W), but only 550 K at aphelion (90° or 270°W). On the dark side of the planet, temperatures average 110 K. The intensity of sunlight on Mercury's surface ranges between 4.59 and 10.61 times the solar constant (1,370 W·m−2). Although the daylight temperature at the surface of Mercury is generally extremely high, observations strongly suggest that ice (frozen water) exists on Mercury. The floors of deep craters at the poles are never exposed to direct sunlight, and temperatures there remain below 102 K; far lower than the global average. Water ice strongly reflects radar, and observations by the 70-meter Goldstone Solar System Radar and the VLA in the early 1990s revealed that there are patches of high radar reflection near the poles. Although ice was not the only possible cause of these reflective regions, astronomers think it was the most likely. The icy regions are estimated to contain about 1014–1015 kg of ice, and may be covered by a layer of regolith that inhibits sublimation. By comparison, the Antarctic ice sheet on Earth has a mass of about 4×1018 kg, and Mars's south polar cap contains about 1016 kg of water. The origin of the ice on Mercury is not yet known, but the two most likely sources are from outgassing of water from the planet's interior or deposition by impacts of comets. Mercury is too small and hot for its gravity to retain any significant atmosphere over long periods of time; it does have a tenuous surface-bounded exosphere containing hydrogen, helium, oxygen, sodium, calcium, potassium and others at a surface pressure of less than approximately 0.5 nPa (0.005 picobars). This exosphere is not stable—atoms are continuously lost and replenished from a variety of sources. Hydrogen atoms and helium atoms probably come from the solar wind, diffusing into Mercury's magnetosphere before later escaping back into space. Radioactive decay of elements within Mercury's crust is another source of helium, as well as sodium and potassium. MESSENGER found high proportions of calcium, helium, hydroxide, magnesium, oxygen, potassium, silicon and sodium. Water vapor is present, released by a combination of processes such as: comets striking its surface, sputtering creating water out of hydrogen from the solar wind and oxygen from rock, and sublimation from reservoirs of water ice in the permanently shadowed polar craters. The detection of high amounts of water-related ions like O+, OH−, and H2O+ was a surprise. Because of the quantities of these ions that were detected in Mercury's space environment, scientists surmise that these molecules were blasted from the surface or exosphere by the solar wind. Sodium, potassium and calcium were discovered in the atmosphere during the 1980–1990s, and are thought to result primarily from the vaporization of surface rock struck by micrometeorite impacts including presently from Comet Encke. In 2008, magnesium was discovered by MESSENGER. Studies indicate that, at times, sodium emissions are localized at points that correspond to the planet's magnetic poles. This would indicate an interaction between the magnetosphere and the planet's surface. Despite its small size and slow 59-day-long rotation, Mercury has a significant, and apparently global, magnetic field. According to measurements taken by Mariner 10, it is about 1.1% the strength of Earth's. The magnetic-field strength at Mercury's equator is about 300 nT. Like that of Earth, Mercury's magnetic field is dipolar. Unlike Earth's, Mercury's poles are nearly aligned with the planet's spin axis. Measurements from both the Mariner 10 and MESSENGER space probes have indicated that the strength and shape of the magnetic field are stable. It is likely that this magnetic field is generated by a dynamo effect, in a manner similar to the magnetic field of Earth. This dynamo effect would result from the circulation of the planet's iron-rich liquid core. Particularly strong tidal effects caused by the planet's high orbital eccentricity would serve to keep the core in the liquid state necessary for this dynamo effect. Mercury's magnetic field is strong enough to deflect the solar wind around the planet, creating a magnetosphere. The planet's magnetosphere, though small enough to fit within Earth, is strong enough to trap solar wind plasma. This contributes to the space weathering of the planet's surface. Observations taken by the Mariner 10 spacecraft detected this low energy plasma in the magnetosphere of the planet's nightside. Bursts of energetic particles in the planet's magnetotail indicate a dynamic quality to the planet's magnetosphere. During its second flyby of the planet on October 6, 2008, MESSENGER discovered that Mercury's magnetic field can be extremely "leaky". The spacecraft encountered magnetic "tornadoes" – twisted bundles of magnetic fields connecting the planetary magnetic field to interplanetary space – that were up to 800 km wide or a third of the radius of the planet. These twisted magnetic flux tubes, technically known as flux transfer events, form open windows in the planet's magnetic shield through which the solar wind may enter and directly impact Mercury's surface via magnetic reconnection This also occurs in Earth's magnetic field. The MESSENGER observations showed the reconnection rate is ten times higher at Mercury, but its proximity to the Sun only accounts for about a third of the reconnection rate observed by MESSENGER. Mercury has the most eccentric orbit of all the planets; its eccentricity is 0.21 with its distance from the Sun ranging from 46,000,000 to 70,000,000 km (29,000,000 to 43,000,000 mi). It takes 87.969 Earth days to complete an orbit. The diagram illustrates the effects of the eccentricity, showing Mercury's orbit overlaid with a circular orbit having the same semi-major axis. Mercury's higher velocity when it is near perihelion is clear from the greater distance it covers in each 5-day interval. In the diagram the varying distance of Mercury to the Sun is represented by the size of the planet, which is inversely proportional to Mercury's distance from the Sun. This varying distance to the Sun leads to Mercury's surface being flexed by tidal bulges raised by the Sun that are about 17 times stronger than the Moon's on Earth. Combined with a 3:2 spin–orbit resonance of the planet's rotation around its axis, it also results in complex variations of the surface temperature. The resonance makes a single solar day on Mercury last exactly two Mercury years, or about 176 Earth days. Mercury's orbit is inclined by 7 degrees to the plane of Earth's orbit (the ecliptic), as shown in the diagram on the right. 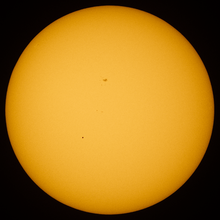 As a result, transits of Mercury across the face of the Sun can only occur when the planet is crossing the plane of the ecliptic at the time it lies between Earth and the Sun. This occurs about every seven years on average. Mercury's axial tilt is almost zero, with the best measured value as low as 0.027 degrees. This is significantly smaller than that of Jupiter, which has the second smallest axial tilt of all planets at 3.1 degrees. This means that to an observer at Mercury's poles, the center of the Sun never rises more than 2.1 arcminutes above the horizon. At certain points on Mercury's surface, an observer would be able to see the Sun peek up about halfway over the horizon, then reverse and set before rising again, all within the same Mercurian day. This is because approximately four Earth days before perihelion, Mercury's angular orbital velocity equals its angular rotational velocity so that the Sun's apparent motion ceases; closer to perihelion, Mercury's angular orbital velocity then exceeds the angular rotational velocity. Thus, to a hypothetical observer on Mercury, the Sun appears to move in a retrograde direction. Four Earth days after perihelion, the Sun's normal apparent motion resumes. A similar effect would have occurred if Mercury had been in synchronous rotation: the alternating gain and loss of rotation over revolution would have caused a libration of 23.65° in longitude. For the same reason, there are two points on Mercury's equator, 180 degrees apart in longitude, at either of which, around perihelion in alternate Mercurian years (once a Mercurian day), the Sun passes overhead, then reverses its apparent motion and passes overhead again, then reverses a second time and passes overhead a third time, taking a total of about 16 Earth-days for this entire process. In the other alternate Mercurian years, the same thing happens at the other of these two points. The amplitude of the retrograde motion is small, so the overall effect is that, for two or three weeks, the Sun is almost stationary overhead, and is at its most brilliant because Mercury is at perihelion, its closest to the Sun. This prolonged exposure to the Sun at its brightest makes these two points the hottest places on Mercury. Conversely, there are two other points on the equator, 90 degrees of longitude apart from the first ones, where the Sun passes overhead only when the planet is at aphelion in alternate years, when the apparent motion of the Sun in Mercury's sky is relatively rapid. These points, which are the ones on the equator where the apparent retrograde motion of the Sun happens when it is crossing the horizon as described in the preceding paragraph, receive much less solar heat than the first ones described above. Mercury attains inferior conjunction (nearest approach to Earth) every 116 Earth days on average, but this interval can range from 105 days to 129 days due to the planet's eccentric orbit. Mercury can come as near as 82.2 gigametres (0.549 astronomical units; 51.1 million miles) to Earth, and that is slowly declining: The next approach to within 82.1 Gm (51.0 million miles) is in 2679, and to within 82.0 Gm (51.0 million miles) in 4487, but it will not be closer to Earth than 80 Gm (50 million miles) until 28,622. Its period of retrograde motion as seen from Earth can vary from 8 to 15 days on either side of inferior conjunction. This large range arises from the planet's high orbital eccentricity. Mercury is on average the closest planet to all of the other planets in the Solar System; this is because planets in larger orbitals spend as much time apart as they do near. Mercury is the closest planet to Earth 46% of the time. The longitude convention for Mercury puts the zero of longitude at one of the two hottest points on the surface, as described above. However, when this area was first visited, by Mariner 10, this zero meridian was in darkness, so it was impossible to select a feature on the surface to define the exact position of the meridian. Therefore, a small crater further west was chosen, called Hun Kal, which provides the exact reference point for measuring longitude. The center of Hun Kal defines the 20° West meridian. A 1970 International Astronomical Union resolution suggests that longitudes be measured positively in the westerly direction on Mercury. The two hottest places on the equator are therefore at longitudes 0°W and 180°W, and the coolest points on the equator are at longitudes 90°W and 270°W. However, the MESSENGER project uses an east-positive convention. The rare 3:2 resonant tidal locking is stabilized by the variance of the tidal force along Mercury's eccentric orbit, acting on a permanent dipole component of Mercury's mass distribution. In a circular orbit there is no such variance, so the only resonance stabilized in such an orbit is at 1:1 (e.g., Earth–Moon), when the tidal force, stretching a body along the "center-body" line, exerts a torque that aligns the body's axis of least inertia (the "longest" axis, and the axis of the aforementioned dipole) to point always at the center. However, with noticeable eccentricity, like that of Mercury's orbit, the tidal force has a maximum at perihelion and therefore stabilizes resonances, like 3:2, enforcing that the planet points its axis of least inertia roughly at the Sun when passing through perihelion. The original reason astronomers thought it was synchronously locked was that, whenever Mercury was best placed for observation, it was always nearly at the same point in its 3:2 resonance, hence showing the same face. This is because, coincidentally, Mercury's rotation period is almost exactly half of its synodic period with respect to Earth. Due to Mercury's 3:2 spin–orbit resonance, a solar day (the length between two meridian transits of the Sun) lasts about 176 Earth days. A sidereal day (the period of rotation) lasts about 58.7 Earth days. Simulations indicate that the orbital eccentricity of Mercury varies chaotically from nearly zero (circular) to more than 0.45 over millions of years due to perturbations from the other planets. This was thought to explain Mercury's 3:2 spin–orbit resonance (rather than the more usual 1:1), because this state is more likely to arise during a period of high eccentricity. However, accurate modeling based on a realistic model of tidal response has demonstrated that Mercury was captured into the 3:2 spin–orbit state at a very early stage of its history, within 20 (more likely, 10) million years after its formation. Numerical simulations show that a future secular orbital resonant perihelion interaction with Jupiter may cause the eccentricity of Mercury's orbit to increase to the point where there is a 1% chance that the planet may collide with Venus within the next five billion years. In 1859, the French mathematician and astronomer Urbain Le Verrier reported that the slow precession of Mercury's orbit around the Sun could not be completely explained by Newtonian mechanics and perturbations by the known planets. He suggested, among possible explanations, that another planet (or perhaps instead a series of smaller 'corpuscules') might exist in an orbit even closer to the Sun than that of Mercury, to account for this perturbation. (Other explanations considered included a slight oblateness of the Sun.) The success of the search for Neptune based on its perturbations of the orbit of Uranus led astronomers to place faith in this possible explanation, and the hypothetical planet was named Vulcan, but no such planet was ever found. The perihelion precession of Mercury is 5,600 arcseconds (1.5556°) per century relative to Earth, or 574.10±0.65 arcseconds per century relative to the inertial ICRF. Newtonian mechanics, taking into account all the effects from the other planets, predicts a precession of 5,557 arcseconds (1.5436°) per century. In the early 20th century, Albert Einstein's general theory of relativity provided the explanation for the observed precession, by formalizing gravitation as being mediated by the curvature of spacetime. The effect is small: just 42.98 arcseconds per century for Mercury; it therefore requires a little over twelve million orbits for a full excess turn. Similar, but much smaller, effects exist for other Solar System bodies: 8.62 arcseconds per century for Venus, 3.84 for Earth, 1.35 for Mars, and 10.05 for 1566 Icarus. the orbital period. Filling in the values gives a result of 0.1035 arcseconds per revolution or 0.4297 arcseconds per Earth year, i.e., 42.97 arcseconds per century. This is in close agreement with the accepted value of Mercury's perihelion advance of 42.98 arcseconds per century. Mercury's apparent magnitude is calculated to vary between −2.48 (brighter than Sirius) around superior conjunction and +7.25 (below the limit of naked-eye visibility) around inferior conjunction. The mean apparent magnitude is 0.23 while the standard deviation of 1.78 is the largest of any planet. The mean apparent magnitude at superior conjunction is −1.89 while that at inferior conjunction is +5.93. Observation of Mercury is complicated by its proximity to the Sun, as it is lost in the Sun's glare for much of the time. Mercury can be observed for only a brief period during either morning or evening twilight. Mercury can, like several other planets and the brightest stars, be seen during a total solar eclipse. Like the Moon and Venus, Mercury exhibits phases as seen from Earth. It is "new" at inferior conjunction and "full" at superior conjunction. The planet is rendered invisible from Earth on both of these occasions because of its being obscured by the Sun, except its new phase during a transit. Mercury is technically brightest as seen from Earth when it is at a full phase. Although Mercury is farthest from Earth when it is full, the greater illuminated area that is visible and the opposition brightness surge more than compensates for the distance. The opposite is true for Venus, which appears brightest when it is a crescent, because it is much closer to Earth than when gibbous. Nonetheless, the brightest (full phase) appearance of Mercury is an essentially impossible time for practical observation, because of the extreme proximity of the Sun. Mercury is best observed at the first and last quarter, although they are phases of lesser brightness. The first and last quarter phases occur at greatest elongation east and west of the Sun, respectively. At both of these times Mercury's separation from the Sun ranges anywhere from 17.9° at perihelion to 27.8° at aphelion. At greatest western elongation, Mercury rises at its earliest before sunrise, and at greatest eastern elongation, it sets at its latest after sunset. Mercury can be easily seen from the tropics and subtropics more than from higher latitudes. Viewed from low latitudes and at the right times of year, the ecliptic intersects the horizon at a steep angle. Mercury is 10° above the horizon when the planet appears directly above the Sun (i.e. its orbit appears vertical) and is at maximum elongation from the Sun (28°) and also when the Sun is 18° below the horizon, so the sky is just completely dark. [d] This angle is the maximum altitude at which Mercury is visible in a completely dark sky. False-color image of Carnegie Rupes, a tectonic landform—high terrain (red); low (blue). At middle latitudes, Mercury is more often and easily visible from the Southern Hemisphere than from the Northern. This is because Mercury's maximum western elongation occurs only during early autumn in the Southern Hemisphere, whereas its greatest eastern elongation happens only during late winter in the Southern Hemisphere. In both of these cases, the angle at which the planet's orbit intersects the horizon is maximized, allowing it to rise several hours before sunrise in the former instance and not set until several hours after sundown in the latter from southern mid-latitudes, such as Argentina and South Africa. An alternate method for viewing Mercury involves observing the planet during daylight hours when conditions are clear, ideally when it is at its greatest elongation. This allows the planet to be found easily, even when using telescopes with 8 cm (3.1 in) apertures. Care must be taken to ensure the instrument isn't pointed directly towards the Sun because of the risk for eye damage. This method bypasses the limitation of twilight observing when the ecliptic is located at a low elevation (e.g. on autumn evenings). Ground-based telescope observations of Mercury reveal only an illuminated partial disk with limited detail. 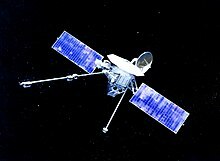 The first of two spacecraft to visit the planet was Mariner 10, which mapped about 45% of its surface from 1974 to 1975. The second is the MESSENGER spacecraft, which after three Mercury flybys between 2008 and 2009, attained orbit around Mercury on March 17, 2011, to study and map the rest of the planet. The Hubble Space Telescope cannot observe Mercury at all, due to safety procedures that prevent its pointing too close to the Sun. Because the shift of 0.15 revolutions in a year makes up a seven-year cycle (0.15 × 7 ≈ 1.0), in the seventh year Mercury follows almost exactly (earlier by 7 days) the sequence of phenomena it showed seven years before. The earliest known recorded observations of Mercury are from the Mul.Apin tablets. These observations were most likely made by an Assyrian astronomer around the 14th century BC. The cuneiform name used to designate Mercury on the Mul.Apin tablets is transcribed as Udu.Idim.Gu\u4.Ud ("the jumping planet"). [e] Babylonian records of Mercury date back to the 1st millennium BC. The Babylonians called the planet Nabu after the messenger to the gods in their mythology. The ancient Greeks knew the planet as Στίλβων (Stilbon), meaning "the gleaming", Ἑρμάων (Hermaon) and Ἑρμής (Hermes), a planetary name that is retained in modern Greek (Ερμής: Ermis). The Romans named the planet after the swift-footed Roman messenger god, Mercury (Latin Mercurius), which they equated with the Greek Hermes, because it moves across the sky faster than any other planet. The astronomical symbol for Mercury is a stylized version of Hermes' caduceus. The Roman-Egyptian astronomer Ptolemy wrote about the possibility of planetary transits across the face of the Sun in his work Planetary Hypotheses. He suggested that no transits had been observed either because planets such as Mercury were too small to see, or because the transits were too infrequent. Ibn al-Shatir's model for the appearances of Mercury, showing the multiplication of epicycles using the Tusi couple, thus eliminating the Ptolemaic eccentrics and equant. In ancient China, Mercury was known as "the Hour Star" (Chen-xing 辰星). It was associated with the direction north and the phase of water in the Five Phases system of metaphysics. Modern Chinese, Korean, Japanese and Vietnamese cultures refer to the planet literally as the "water star" (水星), based on the Five elements. Hindu mythology used the name Budha for Mercury, and this god was thought to preside over Wednesday. The god Odin (or Woden) of Germanic paganism was associated with the planet Mercury and Wednesday. The Maya may have represented Mercury as an owl (or possibly four owls; two for the morning aspect and two for the evening) that served as a messenger to the underworld. Transit of Mercury. Mercury is visible as a black dot below and to the left of center. The dark area above the center of the solar disk is a sunspot. Elongation is the angle between the Sun and the planet, with Earth as the reference point. Mercury appears close to the Sun. The first telescopic observations of Mercury were made by Galileo in the early 17th century. Although he observed phases when he looked at Venus, his telescope was not powerful enough to see the phases of Mercury. In 1631, Pierre Gassendi made the first telescopic observations of the transit of a planet across the Sun when he saw a transit of Mercury predicted by Johannes Kepler. In 1639, Giovanni Zupi used a telescope to discover that the planet had orbital phases similar to Venus and the Moon. The observation demonstrated conclusively that Mercury orbited around the Sun. A rare event in astronomy is the passage of one planet in front of another (occultation), as seen from Earth. Mercury and Venus occult each other every few centuries, and the event of May 28, 1737 is the only one historically observed, having been seen by John Bevis at the Royal Greenwich Observatory. The next occultation of Mercury by Venus will be on December 3, 2133. The difficulties inherent in observing Mercury mean that it has been far less studied than the other planets. In 1800, Johann Schröter made observations of surface features, claiming to have observed 20-kilometre-high (12 mi) mountains. Friedrich Bessel used Schröter's drawings to erroneously estimate the rotation period as 24 hours and an axial tilt of 70°. In the 1880s, Giovanni Schiaparelli mapped the planet more accurately, and suggested that Mercury's rotational period was 88 days, the same as its orbital period due to tidal locking. This phenomenon is known as synchronous rotation. The effort to map the surface of Mercury was continued by Eugenios Antoniadi, who published a book in 1934 that included both maps and his own observations. Many of the planet's surface features, particularly the albedo features, take their names from Antoniadi's map. In June 1962, Soviet scientists at the Institute of Radio-engineering and Electronics of the USSR Academy of Sciences, led by Vladimir Kotelnikov, became the first to bounce a radar signal off Mercury and receive it, starting radar observations of the planet. Three years later, radar observations by Americans Gordon Pettengill and R. Dyce, using the 300-meter Arecibo Observatory radio telescope in Puerto Rico, showed conclusively that the planet's rotational period was about 59 days. The theory that Mercury's rotation was synchronous had become widely held, and it was a surprise to astronomers when these radio observations were announced. 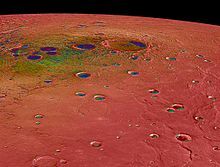 If Mercury were tidally locked, its dark face would be extremely cold, but measurements of radio emission revealed that it was much hotter than expected. Astronomers were reluctant to drop the synchronous rotation theory and proposed alternative mechanisms such as powerful heat-distributing winds to explain the observations. Italian astronomer Giuseppe Colombo noted that the rotation value was about two-thirds of Mercury's orbital period, and proposed that the planet's orbital and rotational periods were locked into a 3:2 rather than a 1:1 resonance. Data from Mariner 10 subsequently confirmed this view. This means that Schiaparelli's and Antoniadi's maps were not "wrong". Instead, the astronomers saw the same features during every second orbit and recorded them, but disregarded those seen in the meantime, when Mercury's other face was toward the Sun, because the orbital geometry meant that these observations were made under poor viewing conditions. Ground-based optical observations did not shed much further light on Mercury, but radio astronomers using interferometry at microwave wavelengths, a technique that enables removal of the solar radiation, were able to discern physical and chemical characteristics of the subsurface layers to a depth of several meters. Not until the first space probe flew past Mercury did many of its most fundamental morphological properties become known. Moreover, recent technological advances have led to improved ground-based observations. In 2000, high-resolution lucky imaging observations were conducted by the Mount Wilson Observatory 1.5 meter Hale telescope. 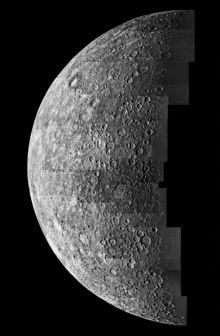 They provided the first views that resolved surface features on the parts of Mercury that were not imaged in the Mariner 10 mission. Most of the planet has been mapped by the Arecibo radar telescope, with 5 km (3.1 mi) resolution, including polar deposits in shadowed craters of what may be water ice. Mercury transiting the Sun as viewed by the Mars rover Curiosity (June 3, 2014). Reaching Mercury from Earth poses significant technical challenges, because it orbits so much closer to the Sun than Earth. A Mercury-bound spacecraft launched from Earth must travel over 91 million kilometres (57 million miles) into the Sun's gravitational potential well. Mercury has an orbital speed of 48 km/s (30 mi/s), whereas Earth's orbital speed is 30 km/s (19 mi/s). Therefore, the spacecraft must make a large change in velocity (delta-v) to enter a Hohmann transfer orbit that passes near Mercury, as compared to the delta-v required for other planetary missions. The potential energy liberated by moving down the Sun's potential well becomes kinetic energy; requiring another large delta-v change to do anything other than rapidly pass by Mercury. To land safely or enter a stable orbit the spacecraft would rely entirely on rocket motors. Aerobraking is ruled out because Mercury has a negligible atmosphere. A trip to Mercury requires more rocket fuel than that required to escape the Solar System completely. As a result, only two space probes have visited it so far. A proposed alternative approach would use a solar sail to attain a Mercury-synchronous orbit around the Sun. The first spacecraft to visit Mercury was NASA's Mariner 10 (1974–1975). The spacecraft used the gravity of Venus to adjust its orbital velocity so that it could approach Mercury, making it both the first spacecraft to use this gravitational "slingshot" effect and the first NASA mission to visit multiple planets. Mariner 10 provided the first close-up images of Mercury's surface, which immediately showed its heavily cratered nature, and revealed many other types of geological features, such as the giant scarps that were later ascribed to the effect of the planet shrinking slightly as its iron core cools. Unfortunately, the same face of the planet was lit at each of Mariner 10's close approaches. This made close observation of both sides of the planet impossible, and resulted in the mapping of less than 45% of the planet's surface. The spacecraft made three close approaches to Mercury, the closest of which took it to within 327 km (203 mi) of the surface. At the first close approach, instruments detected a magnetic field, to the great surprise of planetary geologists—Mercury's rotation was expected to be much too slow to generate a significant dynamo effect. The second close approach was primarily used for imaging, but at the third approach, extensive magnetic data were obtained. The data revealed that the planet's magnetic field is much like Earth's, which deflects the solar wind around the planet. For many years after the Mariner 10 encounters, the origin of Mercury's magnetic field remained the subject of several competing theories. On March 24, 1975, just eight days after its final close approach, Mariner 10 ran out of fuel. Because its orbit could no longer be accurately controlled, mission controllers instructed the probe to shut down. Mariner 10 is thought to be still orbiting the Sun, passing close to Mercury every few months. 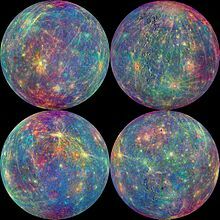 A second NASA mission to Mercury, named MESSENGER (MErcury Surface, Space ENvironment, GEochemistry, and Ranging), was launched on August 3, 2004. It made a fly-by of Earth in August 2005, and of Venus in October 2006 and June 2007 to place it onto the correct trajectory to reach an orbit around Mercury. A first fly-by of Mercury occurred on January 14, 2008, a second on October 6, 2008, and a third on September 29, 2009. Most of the hemisphere not imaged by Mariner 10 was mapped during these fly-bys. The probe successfully entered an elliptical orbit around the planet on March 18, 2011. The first orbital image of Mercury was obtained on March 29, 2011. The probe finished a one-year mapping mission, and then entered a one-year extended mission into 2013. In addition to continued observations and mapping of Mercury, MESSENGER observed the 2012 solar maximum. The mission was designed to clear up six key issues: Mercury's high density, its geological history, the nature of its magnetic field, the structure of its core, whether it has ice at its poles, and where its tenuous atmosphere comes from. To this end, the probe carried imaging devices that gathered much-higher-resolution images of much more of Mercury than Mariner 10, assorted spectrometers to determine abundances of elements in the crust, and magnetometers and devices to measure velocities of charged particles. Measurements of changes in the probe's orbital velocity were expected to be used to infer details of the planet's interior structure. MESSENGER's final maneuver was on April 24, 2015, and it crashed into Mercury's surface on April 30, 2015. The spacecraft's impact with Mercury occurred near 3:26 PM EDT on April 30, 2015, leaving a crater estimated to be 16 m (52 ft) in diameter. The European Space Agency and the Japanese Space Agency developed and launched a joint mission called BepiColombo, which will orbit Mercury with two probes: one to map the planet and the other to study its magnetosphere. Launched on October 20, 2018, BepiColombo is expected to reach Mercury in 2025. It will release a magnetometer probe into an elliptical orbit, then chemical rockets will fire to deposit the mapper probe into a circular orbit. Both probes will operate for one terrestrial year. The mapper probe carries an array of spectrometers similar to those on MESSENGER, and will study the planet at many different wavelengths including infrared, ultraviolet, X-ray and gamma ray. ^ In astronomy, the words "rotation" and "revolution" have different meanings. "Rotation" is the turning of a body about an axis that passes through the body, as in "Earth rotates once a day." "Revolution" is motion around a centre that is external to the body, usually in orbit, as in "Earth takes a year for each revolution around the Sun." The verbs "rotate" and "revolve" mean doing rotation and revolution, respectively. ^ Pluto was considered a planet from its discovery in 1930 to 2006, but after that it has been reclassified as a dwarf planet. Pluto's orbital eccentricity is greater than Mercury's. Pluto is also smaller than Mercury, but was thought to be larger until 1976. ^ If the area of Washington is about 177 km2 and 2.5 miles is taken to equal 4 km, Solomon's estimate would equal about 700 cubic kilometres of ice, which would have a mass of about 600 billion tons (6×1014 kg). ^ Some sources precede the cuneiform transcription with "MUL". "MUL" is a cuneiform sign that was used in the Sumerian language to designate a star or planet, but it is not considered part of the actual name. The "4" is a reference number in the Sumero-Akkadian transliteration system to designate which of several syllables a certain cuneiform sign is most likely designating. ^ "Mercurian". Oxford University Press. Retrieved December 15, 2016. ^ "mercurial". Merriam-Webster Online. Retrieved June 12, 2008. ^ a b c d e f g h i j "Mercury Fact Sheet". NASA Goddard Space Flight Center. November 30, 2007. Archived from the original on March 28, 2014. Retrieved May 28, 2008. ^ Yeomans, Donald K. (April 7, 2008). "HORIZONS Web-Interface for Mercury Major Body". JPL Horizons On-Line Ephemeris System. Retrieved April 7, 2008. – Select "Ephemeris Type: Orbital Elements", "Time Span: 2000-01-01 12:00 to 2000-01-02". ("Target Body: Mercury" and "Center: Sun" should be defaulted to.) Results are instantaneous osculating values at the precise J2000 epoch. ^ a b c d e f g Munsell, Kirk; Smith, Harman; Harvey, Samantha (May 28, 2009). "Mercury: Facts & Figures". Solar System Exploration. NASA. Retrieved April 7, 2008. ^ Mazarico, Erwan; Genova, Antonio; Goossens, Sander; Lemoine, Frank G.; Neumann, Gregory A.; Zuber, Maria T.; Smith, David E.; Solomon, Sean C. (2014). "The gravity field, orientation, and ephemeris of Mercury from MESSENGER observations after three years in orbit". Journal of Geophysical Research: Planets. 119 (12): 2417–2436. Bibcode:2014JGRE..119.2417M. doi:10.1002/2014JE004675. hdl:1721.1/97927. ISSN 2169-9097. ^ a b Margot, Jean-Luc; Peale, Stanton J.; Solomon, Sean C.; Hauck, Steven A.; Ghigo, Frank D.; Jurgens, Raymond F.; Yseboodt, Marie; Giorgini, Jon D.; Padovan, Sebastiano; Campbell, Donald B. (2012). "Mercury's moment of inertia from spin and gravity data". Journal of Geophysical Research: Planets. 117 (E12): n/a. Bibcode:2012JGRE..117.0L09M. doi:10.1029/2012JE004161. ISSN 0148-0227. ^ Mallama, Anthony (2017). "The spherical bolometric albedo for planet Mercury". arXiv:1703.02670. Bibcode:2017arXiv170302670M. ^ Mallama, A.; Wang, D.; Howard, R.A. (2002). "Photometry of Mercury from SOHO/LASCO and Earth". Icarus. 155 (2): 253–264. Bibcode:2002Icar..155..253M. doi:10.1006/icar.2001.6723. ^ a b c d Vasavada, Ashwin R.; Paige, David A.; Wood, Stephen E. (February 19, 1999). "Near-Surface Temperatures on Mercury and the Moon and the Stability of Polar Ice Deposits" (PDF). Icarus. 141 (2): 179–193. Bibcode:1999Icar..141..179V. doi:10.1006/icar.1999.6175. Figure 3 with the "TWO model"; Figure 5 for pole. ^ a b c Mallama, Anthony; Hilton, James L. (October 2018). "Computing apparent planetary magnitudes for The Astronomical Almanac". Astronomy and Computing. 25: 10–24. arXiv:1808.01973. Bibcode:2018A&C....25...10M. doi:10.1016/j.ascom.2018.08.002. ^ a b "Mercury Fact Sheet". NASA. December 22, 2015. Archived from the original on November 6, 2015. Retrieved January 27, 2016. ^ "Animated clip of orbit and rotation of Mercury". Sciencenetlinks.com. ^ Talbert, Tricia, ed. (March 21, 2012). "MESSENGER Provides New Look at Mercury's Surprising Core and Landscape Curiosities". NASA. ^ "Scientists find evidence Mercury has a solid inner core". AGU Newsroom. Retrieved April 17, 2019. ^ a b c d e f g h Strom, Robert G.; Sprague, Ann L. (2003). Exploring Mercury: the iron planet. Springer. ISBN 978-1-85233-731-5. ^ "Mercury". US Geological Survey. May 8, 2003. Archived from the original on September 29, 2006. Retrieved November 26, 2006. ^ Lyttleton, R. A. (1969). "On the Internal Structures of Mercury and Venus". Astrophysics and Space Science. 5 (1): 18–35. Bibcode:1969Ap&SS...5...18L. doi:10.1007/BF00653933. ^ Gold, Lauren (May 3, 2007). "Mercury has molten core, Cornell researcher shows". Chronicle Online. Cornell University. Retrieved May 12, 2008. ^ a b Finley, Dave (May 3, 2007). "Mercury's Core Molten, Radar Study Shows". National Radio Astronomy Observatory. Retrieved May 12, 2008. ^ Spohn, Tilman; Sohl, Frank; Wieczerkowski, Karin; Conzelmann, Vera (2001). "The interior structure of Mercury: what we know, what we expect from BepiColombo". Planetary and Space Science. 49 (14–15): 1561–1570. Bibcode:2001P&SS...49.1561S. doi:10.1016/S0032-0633(01)00093-9. ^ Padovan, Sebastiano; Wieczorek, Mark A.; Margot, Jean-Luc; Tosi, Nicola; Solomon, Sean C. (2015). "Thickness of the crust of Mercury from geoid-to-topography ratios". Geophysical Research Letters. 42 (4): 1029. Bibcode:2015GeoRL..42.1029P. doi:10.1002/2014GL062487. ^ Schenk, P.; Melosh, H. J. (March 1994). "Lobate Thrust Scarps and the Thickness of Mercury's Lithosphere". Abstracts of the 25th Lunar and Planetary Science Conference. 1994: 1994LPI....25.1203S. Bibcode:1994LPI....25.1203S. ^ a b c d Benz, W.; Slattery, W. L.; Cameron, A. G. W. (1988). "Collisional stripping of Mercury's mantle". Icarus. 74 (3): 516–528. Bibcode:1988Icar...74..516B. doi:10.1016/0019-1035(88)90118-2. ^ a b Cameron, A. G. W. (1985). "The partial volatilization of Mercury". Icarus. 64 (2): 285–294. Bibcode:1985Icar...64..285C. doi:10.1016/0019-1035(85)90091-0. ^ Weidenschilling, S. J. (1987). "Iron/silicate fractionation and the origin of Mercury". Icarus. 35 (1): 99–111. Bibcode:1978Icar...35...99W. doi:10.1016/0019-1035(78)90064-7. ^ Sappenfield, Mark (September 29, 2011). "Messenger's message from Mercury: Time to rewrite the textbooks". The Christian Science Monitor. Retrieved August 21, 2017. ^ "BepiColombo". Science & Technology. European Space Agency. Retrieved April 7, 2008. ^ Cartwright, Jon (September 30, 2011). "Messenger sheds light on Mercury's formation". Chemistry World. Retrieved August 21, 2017. ^ "Scientists see Mercury in a new light". Science Daily. February 28, 2008. Retrieved April 7, 2008. ^ "The Giant Spider of Mercury". The Planetary Society. Retrieved June 9, 2017. ^ Blue, Jennifer (April 11, 2008). "Gazetteer of Planetary Nomenclature". US Geological Survey. Retrieved April 11, 2008. ^ a b Dunne, James A.; Burgess, Eric (1978). "Chapter Seven". The Voyage of Mariner 10 – Mission to Venus and Mercury. NASA History Office. Retrieved May 28, 2008. ^ "Categories for Naming Features on Planets and Satellites". US Geological Survey. Retrieved August 20, 2011. ^ Strom, Robert (1979). "Mercury: a post-Mariner assessment". Space Science Reviews. 24 (1): 3–70. Bibcode:1979SSRv...24....3S. doi:10.1007/BF00221842. ^ Broadfoot, A. L.; S. Kumar; M. J. S. Belton; M. B. McElroy (July 12, 1974). "Mercury's Atmosphere from Mariner 10: Preliminary Results". Science. 185 (4146): 166–169. Bibcode:1974Sci...185..166B. doi:10.1126/science.185.4146.166. PMID 17810510. ^ "Mercury". U.S. Geological Survey. August 5, 2003. Archived from the original on September 29, 2006. Retrieved April 7, 2008. ^ Head, James W.; Solomon, Sean C. (1981). "Tectonic Evolution of the Terrestrial Planets" (PDF). Science. 213 (4503): 62–76. Bibcode:1981Sci...213...62H. CiteSeerX 10.1.1.715.4402. doi:10.1126/science.213.4503.62. PMID 17741171. ^ Morris, Jefferson (November 10, 2008). "Laser Altimetry". Aviation Week & Space Technology. 169 (18): 18. Mercury's crust is more analogous to a marbled cake than a layered cake. ^ a b c d e f g Spudis, P. D. (2001). "The Geological History of Mercury". Workshop on Mercury: Space Environment, Surface, and Interior, Chicago (1097): 100. Bibcode:2001mses.conf..100S. ^ Ritzel, Rebecca (December 20, 2012). "Ballet isn't rocket science, but the two aren't mutually exclusive, either". Washington Post. Washington, D.C., United States. Retrieved December 22, 2012. ^ Shiga, David (January 30, 2008). "Bizarre spider scar found on Mercury's surface". NewScientist.com news service. ^ Schultz, Peter H.; Gault, Donald E. (1975). "Seismic effects from major basin formations on the moon and Mercury". Earth, Moon, and Planets. 12 (2): 159–175. Bibcode:1975Moon...12..159S. doi:10.1007/BF00577875. ^ Wieczorek, Mark A.; Zuber, Maria T. (2001). "A Serenitatis origin for the Imbrian grooves and South Pole-Aitken thorium anomaly". Journal of Geophysical Research. 106 (E11): 27853–27864. Bibcode:2001JGR...10627853W. doi:10.1029/2000JE001384. Retrieved May 12, 2008. ^ Denevi, B. W.; Robinson, M. S. (2008). "Albedo of Immature Mercurian Crustal Materials: Evidence for the Presence of Ferrous Iron". Lunar and Planetary Science. 39 (1391): 1750. Bibcode:2008LPI....39.1750D. ^ a b Wagner, R. J.; Wolf, U.; Ivanov, B. A.; Neukum, G. (October 4–5, 2001). Application of an Updated Impact Cratering Chronology Model to Mercury' s Time-Stratigraphic System. Workshop on Mercury: Space Environment, Surface, and Interior. Proceedings of a workshop held at The Field Museum. Chicago, IL: Lunar and Planetary Science Institute. p. 106. Bibcode:2001mses.conf..106W. ^ a b Choi, C. Q. (September 26, 2016). "Mercuryquakes May Currently Shake Up the Tiny Planet". Space.com. Retrieved September 28, 2016. ^ Dzurisin, D. (October 10, 1978). "The tectonic and volcanic history of Mercury as inferred from studies of scarps, ridges, troughs, and other lineaments". Journal of Geophysical Research. 83 (B10): 4883–4906. Bibcode:1978JGR....83.4883D. doi:10.1029/JB083iB10p04883. ^ a b Watters, T. R.; Daud, K.; Banks, M. E.; Selvans, M. M.; Chapman, C. R.; Ernst, C. M. (September 26, 2016). "Recent tectonic activity on Mercury revealed by small thrust fault scarps". Nature Geoscience. 9 (10): 743–747. Bibcode:2016NatGe...9..743W. doi:10.1038/ngeo2814. ^ Kerber, Laura; Head, James W.; Solomon, Sean C.; Murchie, Scott L.; Blewett, David T. (August 15, 2009). "Explosive volcanic eruptions on Mercury: Eruption conditions, magma volatile content, and implications for interior volatile abundances". Earth and Planetary Science Letters. 119 (3): 635–658. Bibcode:2009E&PSL.285..263K. doi:10.1016/j.epsl.2009.04.037. Retrieved April 4, 2015. ^ Head, James W.; Chapman, Clark R.; Strom, Robert G.; Fassett, Caleb I.; Denevi, Brett W. (September 30, 2011). "Flood Volcanism in the Northern High Latitudes of Mercury Revealed by MESSENGER". Science. 333 (6051): 1853–1856. Bibcode:2011Sci...333.1853H. doi:10.1126/science.1211997. PMID 21960625. Retrieved April 4, 2015. ^ Thomas, Rebecca J.; Rothery, David A.; Conway, Susan J.; Anand, Mahesh (September 16, 2014). "Long-lived explosive volcanism on Mercury". Geophysical Research Letters. 41 (17): 6084–6092. Bibcode:2014GeoRL..41.6084T. doi:10.1002/2014GL061224. ^ a b c Groudge, Timothy A.; Head, James W. (March 2014). "Global inventory and characterization of pyroclastic deposits on Mercury: New insights into pyroclastic activity from MESSENGER orbital data". Journal of Geophysical Research. 119 (3): 635–658. Bibcode:2014JGRE..119..635G. doi:10.1002/2013JE004480. ^ a b c Rothery, David A.; Thomas, Rebeca J.; Kerber, Laura (January 1, 2014). "Prolonged eruptive history of a compound volcano on Mercury: Volcanic and tectonic implications". Earth and Planetary Science Letters. 385: 59–67. Bibcode:2014E&PSL.385...59R. doi:10.1016/j.epsl.2013.10.023. Retrieved April 4, 2015. ^ a b Chang, Kenneth (November 29, 2012). "On Closest Planet to the Sun, NASA Finds Lots of Ice". The New York Times. p. A3. Archived from the original on November 29, 2012. Sean C. Solomon, the principal investigator for MESSENGER, said there was enough ice there to encase Washington, D.C., in a frozen block two and a half miles deep. ^ Murdock, T. L.; Ney, E. P. (1970). "Mercury: The Dark-Side Temperature". Science. 170 (3957): 535–537. Bibcode:1970Sci...170..535M. doi:10.1126/science.170.3957.535. PMID 17799708. ^ Lewis, John S. (2004). Physics and Chemistry of the Solar System. Academic Press. ISBN 978-0-12-446744-6. Retrieved June 3, 2008. ^ Ingersoll, Andrew P.; Svitek, Tomas; Murray, Bruce C. (1992). "Stability of polar frosts in spherical bowl-shaped craters on the moon, Mercury, and Mars". Icarus. 100 (1): 40–47. Bibcode:1992Icar..100...40I. doi:10.1016/0019-1035(92)90016-Z. ^ Slade, M. A.; Butler, B. J.; Muhleman, D. O. (1992). "Mercury radar imaging – Evidence for polar ice". Science. 258 (5082): 635–640. Bibcode:1992Sci...258..635S. doi:10.1126/science.258.5082.635. PMID 17748898. ^ Williams, David R. (June 2, 2005). "Ice on Mercury". NASA Goddard Space Flight Center. Retrieved May 23, 2008. ^ a b c Rawlins, K; Moses, J. I.; Zahnle, K.J. (1995). "Exogenic Sources of Water for Mercury's Polar Ice". Bulletin of the American Astronomical Society. 27: 1117. Bibcode:1995DPS....27.2112R. ^ Harmon, John K.; Perillat, Phil J.; Slade, Martin A. (2001). "High-Resolution Radar Imaging of Mercury's North Pole". Icarus. 149 (1): 1–15. Bibcode:2001Icar..149....1H. doi:10.1006/icar.2000.6544. ^ Domingue DL, Koehn PL, et al. (2009). "Mercury's Atmosphere: A Surface-Bounded Exosphere". Space Science Reviews. 131 (1–4): 161–186. Bibcode:2007SSRv..131..161D. doi:10.1007/s11214-007-9260-9. ^ Hunten, D. M.; Shemansky, D. E.; Morgan, T. H. (1988). "The Mercury atmosphere" (PDF). Mercury. University of Arizona Press. ISBN 978-0-8165-1085-6. ^ Lakdawalla, Emily (July 3, 2008). "MESSENGER Scientists 'Astonished' to Find Water in Mercury's Thin Atmosphere". Retrieved May 18, 2009. ^ Zurbuchen TH, Raines JM, et al. (2008). "MESSENGER Observations of the Composition of Mercury's Ionized Exosphere and Plasma Environment". Science. 321 (5885): 90–92. Bibcode:2008Sci...321...90Z. doi:10.1126/science.1159314. PMID 18599777. ^ "Instrument Shows What Planet Mercury Is Made Of". University of Michigan. June 30, 2008. Retrieved May 18, 2009. ^ Killen, Rosemary; Cremonese, Gabrielle; et al. (2007). "Processes that Promote and Deplete the Exosphere of Mercury". Space Science Reviews. 132 (2–4): 433–509. Bibcode:2007SSRv..132..433K. doi:10.1007/s11214-007-9232-0. ^ Rosemary M. Killen; Joseph M. Hahn (December 10, 2014). "Impact Vaporization as a Possible Source of Mercury's Calcium Exosphere". Icarus. 250: 230–237. Bibcode:2015Icar..250..230K. doi:10.1016/j.icarus.2014.11.035. hdl:2060/20150010116. ^ McClintock, William E.; Vervack, Ronald J.; et al. (2009). "MESSENGER Observations of Mercury's Exosphere: Detection of Magnesium and Distribution of Constituents". Science. 324 (5927): 610–613. Bibcode:2009Sci...324..610M. doi:10.1126/science.1172525 (inactive December 15, 2018). PMID 19407195. ^ a b c d e Beatty, J. Kelly; Petersen, Carolyn Collins; Chaikin, Andrew (1999). The New Solar System. Cambridge University Press. ISBN 978-0-521-64587-4. ^ Seeds, Michael A. (2004). Astronomy: The Solar System and Beyond (4th ed.). Brooks Cole. ISBN 978-0-534-42111-3. ^ Williams, David R. (January 6, 2005). "Planetary Fact Sheets". NASA National Space Science Data Center. Retrieved August 10, 2006. ^ a b c "Mercury's Internal Magnetic Field". NASA. January 30, 2008. Archived from the original on March 31, 2013. Retrieved April 7, 2008. ^ Gold, Lauren (May 3, 2007). "Mercury has molten core, Cornell researcher shows". Cornell University. Retrieved April 7, 2008. ^ Christensen, Ulrich R. (2006). "A deep dynamo generating Mercury's magnetic field". Nature. 444 (7122): 1056–1058. Bibcode:2006Natur.444.1056C. doi:10.1038/nature05342. PMID 17183319. ^ Spohn, T.; Sohl, F.; Wieczerkowski, K.; Conzelmann, V. (2001). "The interior structure of Mercury: what we know, what we expect from BepiColombo". Planetary and Space Science. 49 (14–15): 1561–1570. Bibcode:2001P&SS...49.1561S. doi:10.1016/S0032-0633(01)00093-9. ^ a b Steigerwald, Bill (June 2, 2009). "Magnetic Tornadoes Could Liberate Mercury's Tenuous Atmosphere". NASA Goddard Space Flight Center. Retrieved July 18, 2009. ^ Van Hoolst, Tim; Jacobs, Carla (2003). "Mercury's tides and interior structure". Journal of Geophysical Research. 108 (E11): 7. Bibcode:2003JGRE..108.5121V. doi:10.1029/2003JE002126. ^ "Space Topics: Compare the Planets: Mercury, Venus, Earth, The Moon, and Mars". Planetary Society. Archived from the original on August 21, 2011. Retrieved April 12, 2007. ^ Espenak, Fred (April 21, 2005). "Transits of Mercury". NASA/Goddard Space Flight Center. Retrieved May 20, 2008. ^ Biswas, Sukumar (2000). Cosmic Perspectives in Space Physics. Astrophysics and Space Science Library. Springer. p. 176. ISBN 978-0-7923-5813-8. ^ a b Margot, J. L.; Peale, S. J.; Jurgens, R. F.; Slade, M. A.; et al. (2007). "Large Longitude Libration of Mercury Reveals a Molten Core". Science. 316 (5825): 710–714. Bibcode:2007Sci...316..710M. doi:10.1126/science.1140514. PMID 17478713. ^ Popular Astronomy: A Review of Astronomy and Allied Sciences. Goodsell Observatory of Carleton College. 1896. ^ Mandelbaum, Ryan F. (March 14, 2019). "Mercury, Not Venus, Is the Closest Planet to Earth". Gizmodo. Retrieved March 21, 2019. ^ Harford, Tim (January 11, 2019). "BBC Radio 4 - More or Less, Sugar, Outdoors Play and Planets". BBC. Oliver Hawkins, more or less alumnus and statistical legend, wrote some code for us, which calculated which planet was closest to the Earth on each day for the past 50 years, and then sent the results to David A. Rothery, professor of planetary geosciences at the Open University. ^ "USGS Astrogeology: Rotation and pole position for the Sun and planets (IAU WGCCRE)". Archived from the original on October 24, 2011. Retrieved October 22, 2009. ^ Archinal, Brent A.; A'Hearn, Michael F.; Bowell, Edward L.; Conrad, Albert R.; et al. (2010). "Report of the IAU Working Group on Cartographic Coordinates and Rotational Elements: 2009". Celestial Mechanics and Dynamical Astronomy. 109 (2): 101–135. Bibcode:2011CeMDA.109..101A. doi:10.1007/s10569-010-9320-4. ISSN 0923-2958. ^ Liu, Han-Shou; O'Keefe, John A. (1965). "Theory of Rotation for the Planet Mercury". Science. 150 (3704): 1717. Bibcode:1965Sci...150.1717L. doi:10.1126/science.150.3704.1717. PMID 17768871. ^ a b Colombo, Giuseppe; Shapiro, Irwin I. (1966). "The rotation of the planet Mercury". Astrophysical Journal. 145: 296. Bibcode:1966ApJ...145..296C. doi:10.1086/148762. ^ Correia, Alexandre C.M; Laskar, Jacques (2009). "Mercury's capture into the 3/2 spin–orbit resonance including the effect of core–mantle friction". Icarus. 201 (1): 1–11. arXiv:0901.1843. Bibcode:2009Icar..201....1C. doi:10.1016/j.icarus.2008.12.034. ^ Correia, Alexandre C. M.; Laskar, Jacques (2004). "Mercury's capture into the 3/2 spin–orbit resonance as a result of its chaotic dynamics". Nature. 429 (6994): 848–850. Bibcode:2004Natur.429..848C. doi:10.1038/nature02609. PMID 15215857. ^ Laskar, J. (March 18, 2008). "Chaotic diffusion in the Solar System". Icarus. 196 (1): 1–15. arXiv:0802.3371. Bibcode:2008Icar..196....1L. doi:10.1016/j.icarus.2008.02.017. ^ Laskar, J.; Gastineau, M. (June 11, 2009). "Existence of collisional trajectories of Mercury, Mars and Venus with the Earth". Nature. 459 (7248): 817–819. Bibcode:2009Natur.459..817L. doi:10.1038/nature08096. PMID 19516336. ^ Baum, Richard; Sheehan, William (1997). In Search of Planet Vulcan, The Ghost in Newton's Clockwork Machine. New York: Plenum Press. ISBN 978-0-306-45567-4. ^ a b Clemence, G. M. (1947). "The Relativity Effect in Planetary Motions". Reviews of Modern Physics. 19 (4): 361–364. Bibcode:1947RvMP...19..361C. doi:10.1103/RevModPhys.19.361. ^ Gilvarry, J. J. (1953). "Relativity Precession of the Asteroid Icarus". Physical Review. 89 (5): 1046. Bibcode:1953PhRv...89.1046G. doi:10.1103/PhysRev.89.1046. ^ Anonymous. "6.2 Anomalous Precession". Reflections on Relativity. MathPages. Retrieved May 22, 2008. ^ Nobili, Anna M. (March 1986). "The real value of Mercury's perihelion advance". Nature. 320 (6057): 39–41. Bibcode:1986Natur.320...39N. doi:10.1038/320039a0. ^ a b Menzel, Donald H. (1964). A Field Guide to the Stars and Planets. The Peterson Field Guide Series. Boston: Houghton Mifflin Co. pp. 292–293. ^ Tezel, Tunç (January 22, 2003). "Total Solar Eclipse of 2006 March 29". Department of Physics at Fizik Bolumu in Turkey. Retrieved May 24, 2008. ^ Espenak, Fred (1996). "NASA Reference Publication 1349; Venus: Twelve year planetary ephemeris, 1995–2006". Twelve Year Planetary Ephemeris Directory. NASA. Archived from the original on August 17, 2000. Retrieved May 24, 2008. ^ a b c Kelly, Patrick, ed. (2007). Observer's Handbook 2007. Royal Astronomical Society of Canada. ISBN 978-0-9738109-3-6. ^ Alers, Paul E. (March 17, 2011). "Celebrating Mercury Orbit". NASA Multimedia. Retrieved March 18, 2011. ^ "NASA spacecraft now circling Mercury – a first". MSNBC. March 17, 2011. Retrieved March 24, 2011. ^ Baumgardner, Jeffrey; Mendillo, Michael; Wilson, Jody K. (2000). "A Digital High-Definition Imaging System for Spectral Studies of Extended Planetary Atmospheres. I. Initial Results in White Light Showing Features on the Hemisphere of Mercury Unimaged by Mariner 10". The Astronomical Journal. 119 (5): 2458–2464. Bibcode:2000AJ....119.2458B. doi:10.1086/301323. ^ Schaefer, Bradley E. (2007). "The Latitude and Epoch for the Origin of the Astronomical Lore in Mul.Apin". American Astronomical Society Meeting 210, #42.05. 38: 157. Bibcode:2007AAS...210.4205S. ^ Hunger, Hermann; Pingree, David (1989). "MUL.APIN: An Astronomical Compendium in Cuneiform". Archiv für Orientforschung. 24: 146. ^ "MESSENGER: Mercury and Ancient Cultures". NASA JPL. 2008. Retrieved April 7, 2008. ^ Στίλβων, Ἑρμάων, Ἑρμῆς. Liddell, Henry George; Scott, Robert; A Greek–English Lexicon at the Perseus Project. ^ "Greek Names of the Planets". April 25, 2010. Retrieved July 14, 2012. Ermis is the Greek name of the planet Mercury, which is the closest planet to the Sun. It is named after the Greek God of commerce, Ermis or Hermes, who was also the messenger of the Ancient Greek gods. See also the Greek article about the planet. ^ a b Dunne, James A.; Burgess, Eric (1978). "Chapter One". The Voyage of Mariner 10 – Mission to Venus and Mercury. NASA History Office. ^ Antoniadi, Eugène Michel (1974). The Planet Mercury. Translated from French by Moore, Patrick. Shaldon, Devon: Keith Reid Ltd. pp. 9–11. ISBN 978-0-904094-02-2. ^ Duncan, John Charles (1946). Astronomy: A Textbook. Harper & Brothers. p. 125. The symbol for Mercury represents the Caduceus, a wand with two serpents twined around it, which was carried by the messenger of the gods. ^ Goldstein, Bernard R. (1996). "The Pre-telescopic Treatment of the Phases and Apparent Size of Venus". Journal for the History of Astronomy. 27: 1. Bibcode:1996JHA....27....1G. ^ Kelley, David H.; Milone, E. F.; Aveni, Anthony F. (2004). Exploring Ancient Skies: An Encyclopedic Survey of Archaeoastronomy. Birkhäuser. ISBN 978-0-387-95310-6. ^ De Groot, Jan Jakob Maria (1912). Religion in China: universism. a key to the study of Taoism and Confucianism. American lectures on the history of religions. 10. G. P. Putnam's Sons. p. 300. Retrieved January 8, 2010. ^ Pujari, R.M. ; Kolhe, Pradeep; Kumar, N. R. (2006). Pride of India: A Glimpse Into India's Scientific Heritage. Samskrita Bharati. ISBN 978-81-87276-27-2. ^ Bakich, Michael E. (2000). The Cambridge Planetary Handbook. Cambridge University Press. ISBN 978-0-521-63280-5. ^ Milbrath, Susan (1999). Star Gods of the Maya: Astronomy in Art, Folklore and Calendars. University of Texas Press. ISBN 978-0-292-75226-9. ^ Samsó, Julio; Mielgo, Honorino (1994). "Ibn al-Zarqālluh on Mercury". Journal for the History of Astronomy. 25: 289–96 . Bibcode:1994JHA....25..289S. ^ Hartner, Willy (1955). "The Mercury Horoscope of Marcantonio Michiel of Venice". Vistas in Astronomy. 1: 84–138. Bibcode:1955VA......1...84H. doi:10.1016/0083-6656(55)90016-7. at pp. 118–122. ^ Ansari, S. M. Razaullah (2002). History of oriental astronomy: proceedings of the joint discussion-17 at the 23rd General Assembly of the International Astronomical Union, organised by the Commission 41 (History of Astronomy), held in Kyoto, August 25–26, 1997. Springer. p. 137. ISBN 1-4020-0657-8. ^ Ramasubramanian, K.; Srinivas, M. S.; Sriram, M. S. (1994). "Modification of the Earlier Indian Planetary Theory by the Kerala Astronomers (c. 1500 AD) and the Implied Heliocentric Picture of Planetary Motion" (PDF). Current Science. 66: 784–790. Retrieved April 23, 2010. ^ Sinnott, R. W.; Meeus, J. (1986). "John Bevis and a Rare Occultation". Sky and Telescope. 72: 220. Bibcode:1986S&T....72..220S. ^ Ferris, Timothy (2003). Seeing in the Dark: How Amateur Astronomers. Simon and Schuster. ISBN 978-0-684-86580-5. ^ a b Colombo, G.; Shapiro, I. I. (November 1965). "The Rotation of the Planet Mercury". SAO Special Report #188R. 188: 188. Bibcode:1965SAOSR.188.....C.
^ Holden, E. S. (1890). "Announcement of the Discovery of the Rotation Period of Mercury [by Professor Schiaparelli]". Publications of the Astronomical Society of the Pacific. 2 (7): 79. Bibcode:1890PASP....2...79H. doi:10.1086/120099. ^ Merton E. Davies, et al. (1978). "Surface Mapping". Atlas of Mercury. NASA Office of Space Sciences. Retrieved May 28, 2008. ^ Evans, J. V.; Brockelman, R. A.; Henry, J. C.; Hyde, G. M.; Kraft, L. G.; Reid, W. A.; Smith, W. W. (1965). "Radio Echo Observations of Venus and Mercury at 23 cm Wavelength". Astronomical Journal. 70: 487–500. Bibcode:1965AJ.....70..486E. doi:10.1086/109772. ^ Moore, Patrick (2000). The Data Book of Astronomy. New York: CRC Press. p. 483. ISBN 978-0-7503-0620-1. ^ Butrica, Andrew J. (1996). "Chapter 5". To See the Unseen: A History of Planetary Radar Astronomy. NASA History Office, Washington D.C. ISBN 978-0-16-048578-7. Archived from the original on August 23, 2007. ^ Pettengill, G. H.; Dyce, R. B. (1965). "A Radar Determination of the Rotation of the Planet Mercury". Nature. 206 (1240): 451–2. Bibcode:1965Natur.206Q1240P. doi:10.1038/2061240a0. ^ Murray, Bruce C.; Burgess, Eric (1977). Flight to Mercury. Columbia University Press. ISBN 978-0-231-03996-3. ^ Colombo, G. (1965). "Rotational Period of the Planet Mercury". Nature. 208 (5010): 575. Bibcode:1965Natur.208..575C. doi:10.1038/208575a0. ^ Davies, Merton E.; et al. (1976). "Mariner 10 Mission and Spacecraft". SP-423 Atlas of Mercury. NASA JPL. Retrieved April 7, 2008. ^ Mitchell, David L.; De Pater, Imke (1994). "Microwave Imaging of Mercury's Thermal Emission at Wavelengths from 0.3 to 20.5 cm (1994)". Icarus. 110 (1): 2–32. Bibcode:1994Icar..110....2M. doi:10.1006/icar.1994.1105. ^ Dantowitz, R. F.; Teare, S. W.; Kozubal, M. J. (2000). "Ground-based High-Resolution Imaging of Mercury". Astronomical Journal. 119 (4): 2455–2457. Bibcode:2000AJ....119.2455D. doi:10.1086/301328. ^ Harmon JK, Butler BJ, et al. (2007). "Mercury: Radar images of the equatorial and midlatitude zones". Icarus. 187 (2): 374–405. Bibcode:2007Icar..187..374H. doi:10.1016/j.icarus.2006.09.026. ^ Webster, Guy (June 10, 2014). "Mercury Passes in Front of the Sun, as Seen From Mars". NASA. Retrieved June 10, 2014. ^ a b Dunne, James A. & Burgess, Eric (1978). "Chapter Four". The Voyage of Mariner 10 – Mission to Venus and Mercury. NASA History Office. Retrieved May 28, 2008. ^ "Mercury". NASA Jet Propulsion Laboratory. May 5, 2008. Archived from the original on July 21, 2011. Retrieved May 29, 2008. ^ Leipold, M.; Seboldt, W.; Lingner, S.; Borg, E.; Herrmann, A.; Pabsch, A.; Wagner, O.; Bruckner, J. (1996). "Mercury sun-synchronous polar orbiter with a solar sail". Acta Astronautica. 39 (1): 143–151. Bibcode:1996AcAau..39..143L. doi:10.1016/S0094-5765(96)00131-2. ^ Phillips, Tony (October 1976). "NASA 2006 Transit of Mercury". SP-423 Atlas of Mercury. NASA. Retrieved April 7, 2008. ^ "BepiColumbo – Background Science". European Space Agency. Retrieved June 18, 2017. ^ Malik, Tariq (August 16, 2004). "MESSENGER to test theory of shrinking Mercury". USA Today. Retrieved May 23, 2008. ^ Merton E. Davies, et al. (1978). "Mariner 10 Mission and Spacecraft". Atlas of Mercury. NASA Office of Space Sciences. Retrieved May 30, 2008. ^ Ness, Norman F. (1978). "Mercury – Magnetic field and interior". Space Science Reviews. 21 (5): 527–553. Bibcode:1978SSRv...21..527N. doi:10.1007/BF00240907. ^ Aharonson, Oded; Zuber, Maria T; Solomon, Sean C (2004). "Crustal remanence in an internally magnetized non-uniform shell: a possible source for Mercury's magnetic field?". Earth and Planetary Science Letters. 218 (3–4): 261–268. Bibcode:2004E&PSL.218..261A. doi:10.1016/S0012-821X(03)00682-4. ^ Dunne, James A. & Burgess, Eric (1978). "Chapter Eight". The Voyage of Mariner 10 – Mission to Venus and Mercury. NASA History Office. ^ Grayzeck, Ed (April 2, 2008). "Mariner 10". NSSDC Master Catalog. NASA. Archived from the original on September 8, 2018. Retrieved April 7, 2008. ^ "MESSENGER Engine Burn Puts Spacecraft on Track for Venus". SpaceRef.com. 2005. Retrieved March 2, 2006. ^ a b "Countdown to MESSENGER's Closest Approach with Mercury". Johns Hopkins University Applied Physics Laboratory. January 14, 2008. Archived from the original on May 13, 2013. Retrieved May 30, 2008. ^ "NASA extends spacecraft's Mercury mission". UPI, November 15, 2011. Retrieved November 16, 2011. ^ "MESSENGER: Fact Sheet" (PDF). Applied Physics Laboratory. February 2011. Retrieved August 21, 2017. 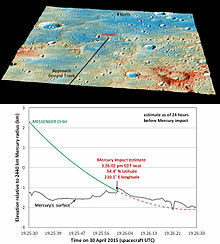 ^ "Details of MESSENGER's Impact Location". MESSENGER Featured Images. JHU – APL. April 29, 2015. Archived from the original on April 30, 2015. Retrieved April 29, 2015. ^ a b "ESA gives go-ahead to build BepiColombo". European Space Agency. February 26, 2007. Retrieved May 29, 2008. ^ "BepiColombo Fact Sheet". European Space Agency. December 1, 2016. Retrieved December 19, 2016. ^ "Objectives". European Space Agency. February 21, 2006. Retrieved May 29, 2008. Atlas of Mercury. NASA. 1978. SP-423.